Check out our review of the Apple MacBook Pro (2013 edition). Settle down, MacBook Pro fans, Apple didn’t forget about you while it was busy fawning over the MacBook Air. After upgrading that slim little brother to Intel’s battery-savvy new Haswell processors back in June, Apple got around to sprucing up the Pros on Tuesday – and they’re getting thinner and cheaper, too. As anticipated, the 13- and 15-inch MacBook Pros will both get Haswell power in their next iteration, which means battery life shoots to 9 hours, up from 7 on the previous versions. Part of that increase can also be attributed to OS X Mavericks, which Apple claims can extend battery life on existing Macs by up to an hour through software optimization alone. Both new models also get new integrated graphics – Intel Iris in the 13-inch model and Iris Pro in the 15-inch model, which Apple claims can match the performance of some discrete GPUs. If you need more power, the larger model can also be upgraded with Nvidia’s GeForce GT 750M. The already-thin 13-inch model will also drop in size and weight – though you would need calipers and a lab-grade scale to tell. It now measures 0.71 inches thick and weighs 3.46 pounds, down from 0.75 inches and 3.57 pounds. 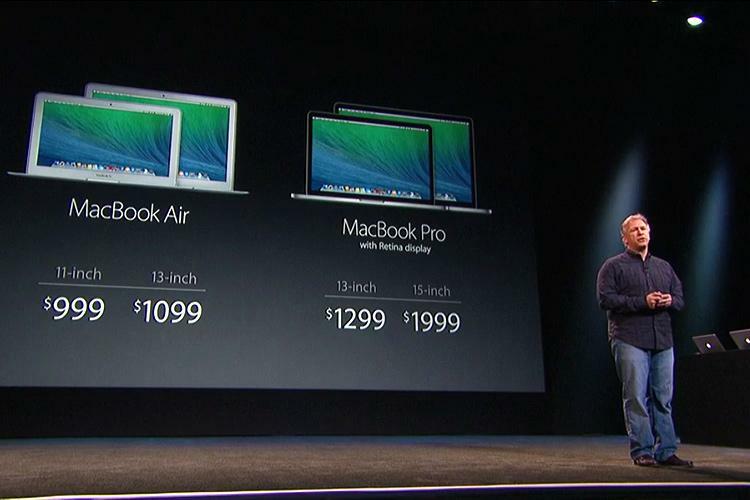 Apple didn’t provide details on the 15-inch Pro. Like the newest MacBook Air, the new MacBook Pros will also sport 802.11ac Wi-Fi and Thunderbolt 2. Incremental spec upgrades aside, the most appealing aspect of the new machines may be the new prices. Apple has dropped the prices on both models by a clean $200: The 13-inch MacBook Pro goes from $1,499 to $1,299, and the 15-inch model from $2,199 to $1,999. That buys you a 2.5GHz Core i5, 4GB of RAM, and a 128GB SSD in the former, and a 2.0GHz quad-core Core i7, 8GB of RAM and a 256GB SSD in the latter. Both go on sale immediately.